It's hard to believe but last year heavy metal heroine Doro Pesch celebrated 25 years in the business. At the young age of 44, she's both an icon and a survivor always delivering the goods with strength and stamina. Even with the most cursory listen to her latest, Fear No Evil, you know this gal isn't slowing down one bit. 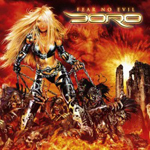 Doro and band bring fundamental melodic heavy metal on Fear No Evil. Though Doro, of course, is the prime focus, she has always been one vocalist who knows the value of good song composition and a talented supporting cast. To this end, after hearing 'Running From The Devil' and 'Celebrate,' to only name two, I think Doro's rhythm section steals the show on this album. The precision and clarity of performance is remarkable on these songs and throughout the whole work. For pure strength and power, the quick and thrash-like 'Caught In The Battle' shows the depth of Doro's metal style. Her vocal diversity, never in doubt, is simply beautiful in the duet with Tarja Turunen on 'Walking With The Angels.' Other highlights include the (slightly cheesy) metal anthem 'Celebrate' and the supremely catchy and more melodic hard rock 'Long Lost For Love.' The album concludes on a rather sentimental metal note with the semi-autobiographical '25 years' where Doro both reflects for us and thanks us. We should be the ones thanking her. Doro's 'Fear No Evil' is an excellent portrait of an artist in her prime; this is classic melodic heavy metal in pure Doro style. Only 25 years? Let's hope for a lot more!